Homemade pumpkin puree is as simple as roasting, scooping, and blending a fresh pumpkin into a simple puree. You are going to love its bright color, smooth texture, and simple preparation. Homemade pumpkin puree is a glorious light orangy-yellow color. It looks quite a bit lighter than canned store-bought pumpkin, too. 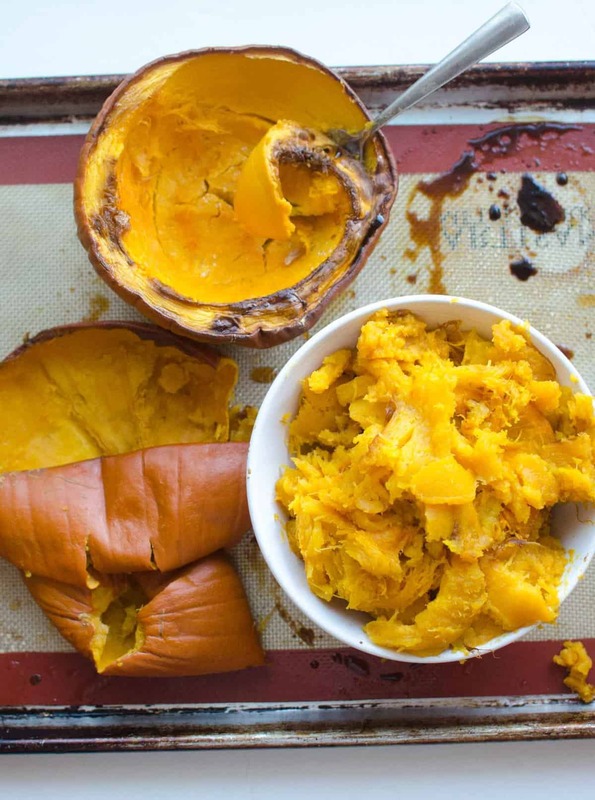 I did a little research to see why this was the case and found out that store-bought canned pumpkin contains more than just traditional pumpkins – it contains a variety of winter squash, like butternut, Hubbard, Boston Marrow, and Golden Delicious. These squash varieties can be less stringy and richer in sweetness and color than pumpkin. Neat, huh? With fresh pumpkins popping up in our gardens, in stores, and at the farmer’s market, I thought it timely to let you know one simple way to turn that little round fall decor into something deliciously edible. 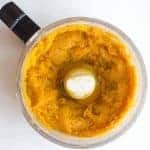 Homemade pumpkin puree is quick and simple to make, stores great, and is a great skill to have up your sleeve. Today is day one of Pumpkin Week 2017! My good friend Emily from One Lovely Life and I are sharing a full week’s worth of our favorite pumpkin recipes and I can’t wait to get started. You can check out her post for glorious pumpkin chili here! I have everything on hand to make this soon and I can’t wait! Stay tuned for allllllll the pumpkin recipes this week! Sugar, sweet, or pie pumpkins are general terms for the smaller 3 to 5 pound pumpkins that are typically grown to be eaten. They’ll be labeled at the store as a pumpkin that is good for baking (generally with a sticker or label attached to them). Their flesh is firmer and sweeter than other varieties, which makes them a great choice for cooking. The insides are a lot less slimy, stringy, and wet than typical jack-o-lantern pumpkins, so prepping them is pretty painless. That being said, you can still cook the pumpkins you normally buy to carve! Most you-pick pumpkin patches will have a section of edible pumpkins/squash so be sure to ask if you go. 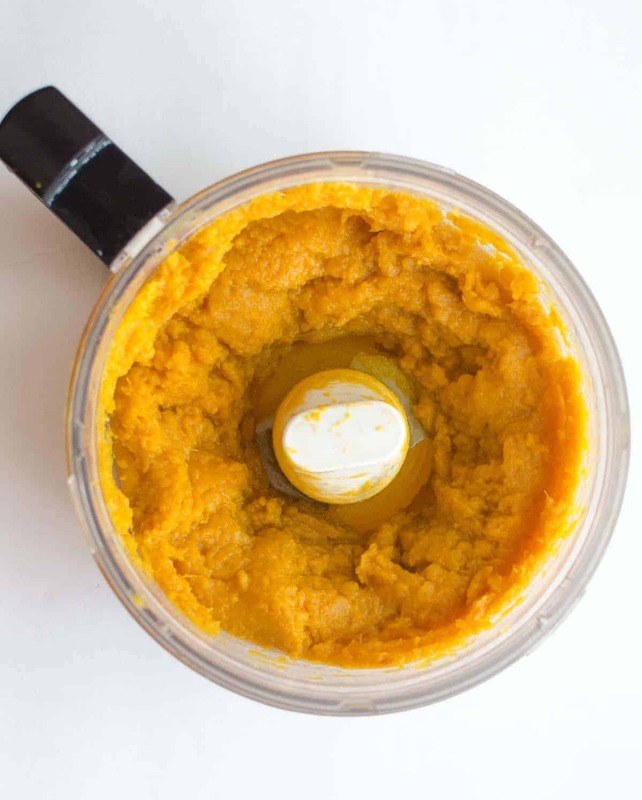 Don’t forget to puree your homemade pumpkin puree in the food processor or blender for that smooth velvety texture. I love to use fresh pumpkin in my fresh pumpkin pie, homemade pumpkin pasta, pumpkin enchiladas, and healthy pumpkin muffins. You can use fresh pumpkin puree in any recipe calling for pumpkin, though the color will be a little different than using canned pumpkin. Homemade pumpkin puree freezes like a dream. Freezing it in one cup proportions is the best option for long-term storage. Prepare your pumpkins by washing the outside under running water. This helps to make sure you don’t get any dirt or other derbis in your homemade pumpkin puree. 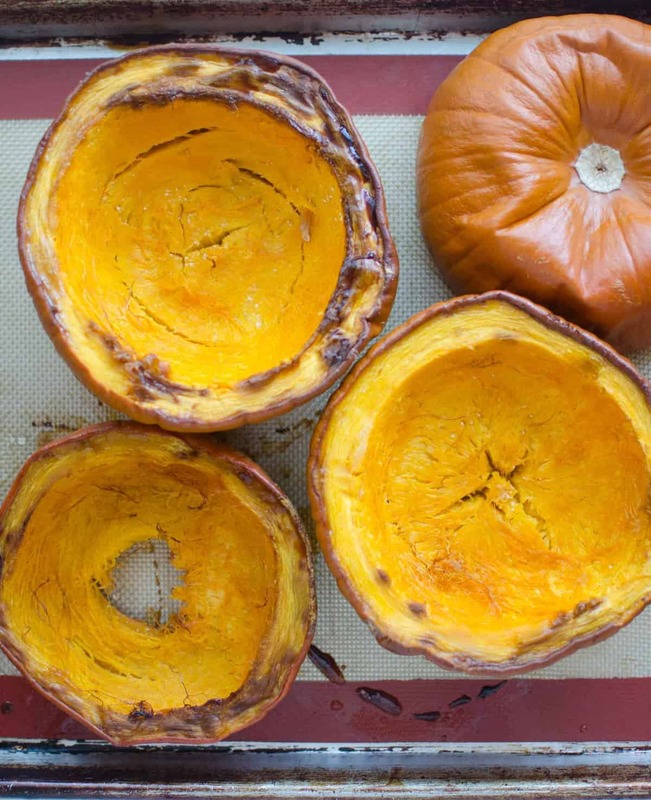 Cut the stem end off of the pumpkin and then cut it in half horizontally to make two pumpkin “bowls”. Scrape the seeds from inside the pumpkin (I like to make honey roasted pumpkin seeds with them!). Flip the pumpkins over so the “bowl” is upside down on a parchment or baking mat rimmed baking sheet). Bake at 375 degrees until the flesh is very soft and can be pierced with a fork – 30 to 40 minutes depending on the size of your pumpkin. Remove from the oven and allow to cool enough to handle. Use a spoon to scrape the flesh from the skin. 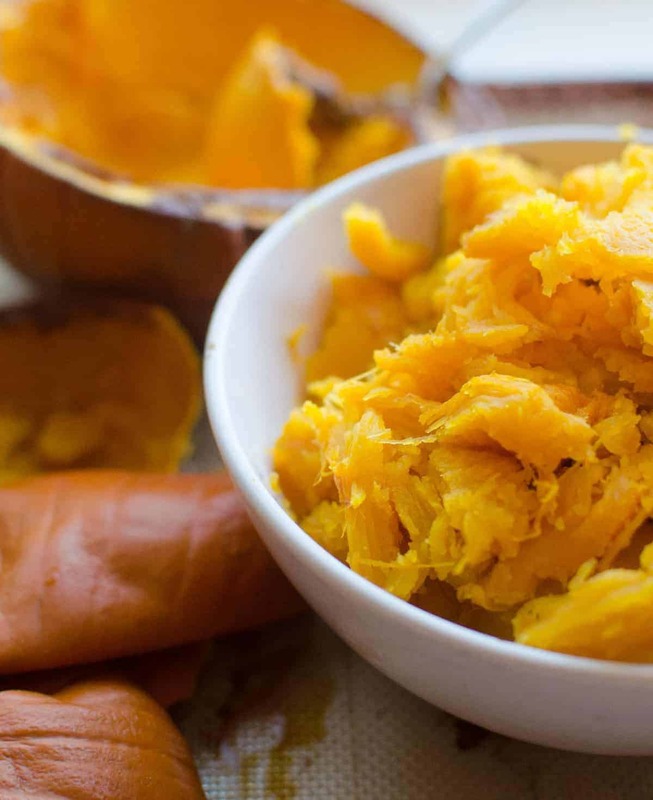 Mash with a fork or for a truly smooth homemade pumpkin puree, toss the cooked pumpkin flesh into a food processor or blender and process until smooth (this is the preferred method over just using a fork). Store pumpkin puree in an air-tight container in the fridge for up to a week or in the freezer for up to 6 months. See the tips and tricks section in the post for all kinds of notes on what kinds of pumpkins to buy and more. How simple is that! Now you know a little bit more about making pumpkin puree at home and why it’s different from store bought pumpkin. I hope you pick up some pumpkins next time you see them just to give this a try. Enjoy pumpkin everything from my home to yours! I roasted some in the oven which were delicious! I roasted some in the crock pot which were tender and amazing! I combined the two for the best of both worlds! When I was done, I realized that in my crockpot was some yummy roasted pumpkin juice…about a cup’s worth. I added a teaspoon of pumpkin pie spice and 6 tablespoons of brown sugar…cooked on med-low fire to boil about 5 minutes to make delectible roasted pumpkin pie spice syrup!